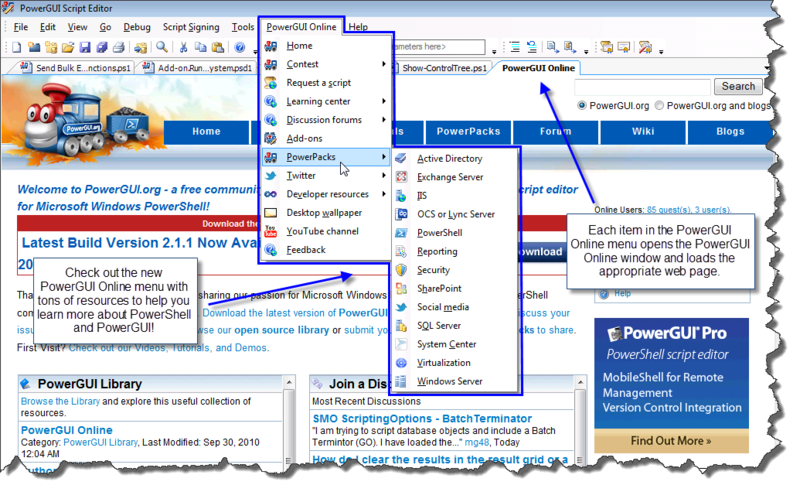 There are a lot of online resources available to help you get the most out of PowerShell and PowerGUI, and this Add-on pulls them all together into one organized menu. If you are not running in STA mode (which means you are running in MTA mode), then the web pages associated with the PowerGUI Online menu items will load in your default web browser when clicked on. This is the first release of this Add-on, so please let us know what you think. It’s really easy. Just click on the Feedback menu item in the new PowerGUI Online menu and leave us a note on our forums. P.S. Keep watching this blog for more useful content related to the PowerGUI Challenge contest that is coming soon. New Module – facilitates the creation of brand new modules from scratch by creating the module folder as well as the script module (psm1) file and the module manifest (psd1) file that defines the module, pre-populating as many relevant details in the manifest as possible such as the module name, description and GUID, the copyright date, your name, your company name, etc. in the appropriate places. New Module Manifest – facilitates the creation of manifest files for existing modules, pre-populating as many relevant details in the manifest as possible such as the module name, description and GUID, the copyright date, your name, your company name, and the complete listing of all files included in the module. 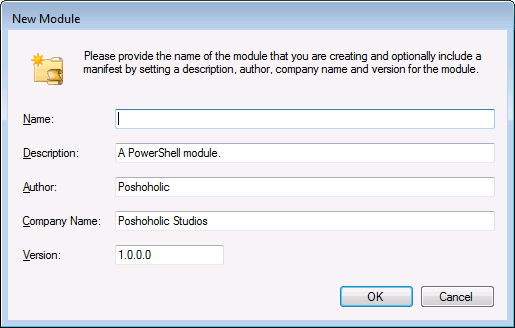 Convert to Module – facilitates creating a new module from an entire script file or from the selected portion of a script file (this also generates the manifest and it is a really easy way to convert from PowerShell 1.0-style ps1 files that act as a function library but cannot be unloaded to PowerShell 2.0 modules that can be loaded and unloaded as needed). The author and company name are pulled directly from your Windows Registry, and the description and version fields are assigned generic default values. You can change these values however you like for your module, and the Add-on will remember the values (aside from name) for the next time you use this command. Also, you can use this dialog to create child modules by specifying a name with backslashes in it. The module that is generated will be placed in the WindowsPowerShell\Modules folder under your user Documents folder, with all files in a folder for the module. 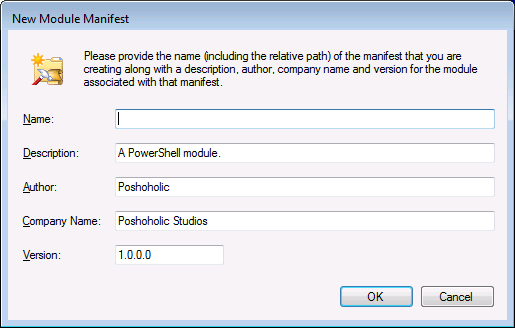 As soon as you enter a name and then click on OK, the module will be created and both the script module (psm1) file and the manifest (psd1) file will open in the Script Editor for editing, allowing you to add them to source control right away if you are using PowerGUI Pro with the source control feature. As an option, you can use this dialog to create a new module without a manifest by simply clearing all fields except for the Name field. Look familiar? It should. 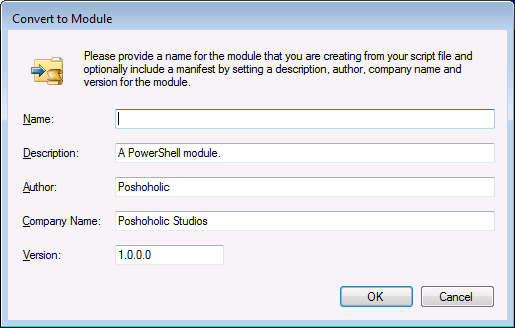 Creating a module manifest for an existing module is very similar to creating a new module because most of the details you provide in this dialog are stored in the module manifest. Just like when you create modules, you can modify these details that are provided by default and you can assign a name (with an optional relative path) for the module for which you are creating a manifest. Once the manifest is created, the Script Editor will open the manifest file automatically. Once more, this should look familiar. All operations for creating modules and manifest accept the same input values because they are all used in each operation. You simply provide the necessary details, or remove all fields except for the module name if you don’t want to use a manifest, and then click on OK for the module to be created and the appropriate files to be opened in the Script Editor for you. These are all very useful features to have at hand, whether you are working on new modules in PowerShell 2.0 or creating PowerShell 2.0 modules from function libraries (ps1 files) that you created in PowerShell 1.0. If this Add-on interests you, simply go to the Module Management Add-on page and follow the installation instructions provided there. As with many other Add-ons I have created, this is an early version of the Add-on so I would love to get your feedback on it. Do you find it useful as is? How you would like to see it improved in a future release? Would you like to see a Module menu and/or toolbar with menu items to add functions and aliases? What else would you like to see for improved module management? I have ideas, but I don’t want to influence your feedback too much, so I’ll keep my ideas to myself and let you speak up about what else you would like to see in this Add-on or others.